Welcome to jobaffairs4u, All of you must be searching for NIOS Deled 504 505 previous year question paper for your exam preparation. Examination Dates for 504 505 are 28 and 29 September 2018 respectively. so today I am sharing Nios 504 505 previous year question paper for all Deled Learners. Lets have a quick look at format of the question paper. Theory Section consist of external examination of 70 marks. Internal marks are in form of Assignments. In NIOS DELED submission of Tutor Marked Assignments is necessary and Integral part of Course Assessment. Maximum marks for NIOS TMA are 30, submission is to be done at your concerned study centre. Learners has to obtain at least 40 percent marks in both theory and assignment marks separately To be declared as passed. For a better preparation of Exam , Previous year paper helps to grasp the format of exam and level of questions asked. In this post learners will get NIOS DELED 504 505 previous year 2016 solved paper. After PAYTM Payment send a mail to ernavneet1990@gmail.com with your last 4 digit paytm number. Solved Paper will be delivered to your mailbox within 5 minutes . 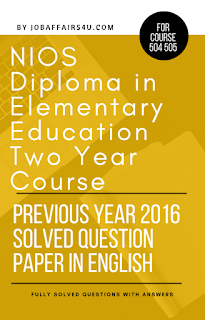 NIOS DELED SECOND YEAR REGISTRATION NEW!